Have you ever worried about the safety of your Blogger blog? As long as you write your blog with the right spirit, it is safe in Google server. They delete a blog from their server only if the blogger team find it is spamming. So theoretically every useful blog is safe with Google. However, it is better you have the backup of your work on your computer to make sure it is cent percent safe. Though Google (Google owns blogger ) is a reliable company, it cannot guarantee cent percent safety for your content and hard work. So I highly recommend taking backups often to counter any unexpected deletion of blogs from their server. Blogger has a feature to export the blog saved in their server. We can use this feature to take the backup. It is very easy to take entire backup of a Blogspot blog to a computer. I strongly recommend you to exportBlogspott site often including images to your computer. So you won't need to worry in case if Google changes its policy in the future. You are safe with your content because you have the backup. It is important to have a backup of all images you have uploaded to a server. I learned it from my experience because I had been using ImageShack to upload pictures but later they discontinued their service. Unless I pay for the service offered by them, they won't keep the pictures I had uploaded to ImageShack server. I lost some of my pictures but couldn't hit me hard because I have the backup. 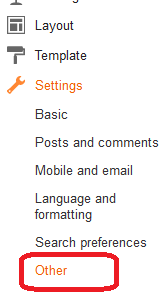 Now let us check how to export the Blogspot site from the server if you are using the classic template. The method is similar to the process we did on the new interface but the export option is on a different page. Now you can save Blogspot backup on your computer. This downloaded file is in XML format. In case if you want to migrate to WordPress, you can use the same file. www.blogjunta.com is organizing THE BEST OF INDIAN BLOGOPSHERE 2010 POLLS.